How to write the perfect press release for a new Wechat app profile or Wechat Public Account? Download our free official press release template! This Press Release template is specifically used to announce a new official public account that your company is starting to use via the Wechat app to attract more followers. What is a official press release definition: a statement prepared and distributed to the press by a public relations firm, governmental agency, etc. Involve a local angle to get local area press coverage. Please browse our website if you are looking for a certain type of press releases. Our free press release templates are used by Public Relations (PR) professionals. 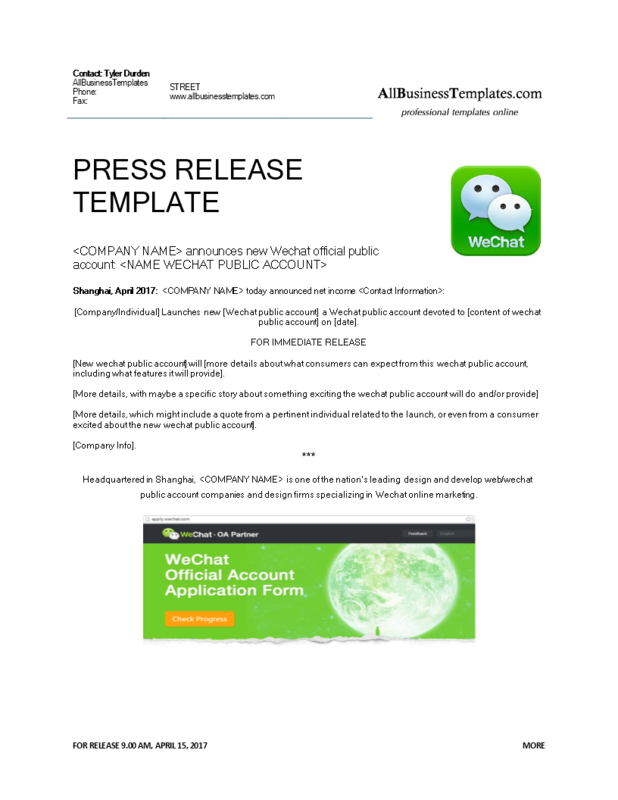 Download this Wechat Account Press release template if you want to announce a new public account on Wechat app and save yourself the time, costs or effort! After downloading and filling in the blanks, you can submit your press release via press release distribution companies, press release distribution sites or local press. Examples include Business Newswire, Dowjones Newswire, Marketwire or PRNewswire. How to write a general public letter or announcement? We provide the best professional, formal and basic general public letter templates for you, which you can send to a wide audience!